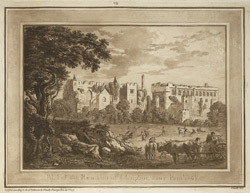 This print entitled ‘Part of the remains of Llanphor, near Pembroke’, was drawn by the Reverend Luttrell Wynn (c.1739-1814). Wynn was the son of a sarjent-at-law and was known for his landscape paintings. The print was created by Paul Sandby, a founding member of the Royal academy and one of the first artists to experiment with the Aquatinting process.